A concertina fold book enclosed in a five sided Flower Blossom Petal. 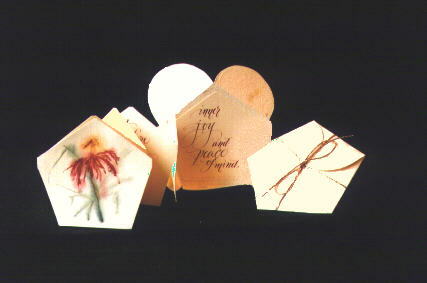 Envelope (made of French paper with petal inclusions). The book uses Diploma Parchment paper and the flower design was done with an automatic pen and watercolor while the lettering used Brause nibs and Dr. Martin's Iridescent Copperplate Gold. Tied with fine gold cord.